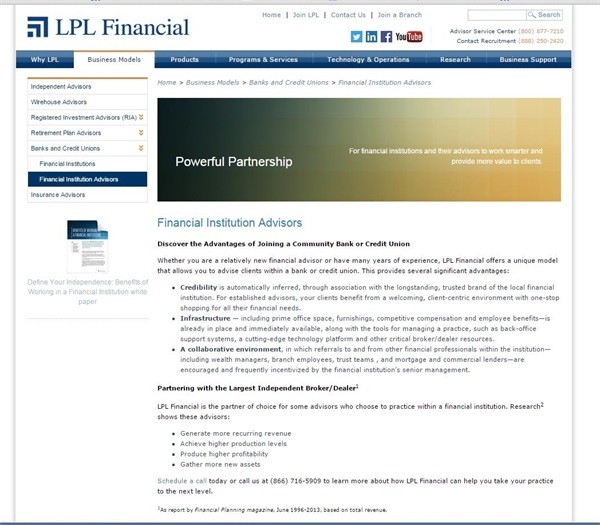 America Group is one of only a handful of investment management firms partnering with LPL Financial that provides a dual platform: Independent Advisor Services and Financial Institution Services (FIS) – working with banks and credit unions. America Group and LPL Financial are dedicated to supporting the needs of independent advisors and empowering them to build the best practices within banks and credit unions. Advisors can find great satisfaction in participating in a financial center that serves a broad range of needs for both individuals and businesses within a community. This opportunity allows advisors to grow their client base while achieving important revenue goals. 1. As report by Financial Planning magazine, June 1996-2018, based on total revenue. 2. 22010 Kehrer-LIMRA Financial Institution Investment Program Benchmarking Survey comparing financial institution advisors who work with other 3rd party broker/dealers. More recent data may alter these assessments our outcomes. Take a few minutes and go to http://www.joinlpl.com and view the business models, product overview, programs and services, technology and operations, research, business support and flexibility of joining the number one Independent broker-dealer* in the country, LPL Financial. If you would like to learn more about our FIS program, please contact Liz Derrick, Director, Talent Acquisition, at 248-485-8102, or email Liz at [email protected]. *As report by Financial Planning magazine, June 1996-2014, based on total revenue.